If you like the spa, but you dislike the price tag that usually accompanies a trip there, then it’s time you checked out portable infrared saunas. You can find a ton of different types – like the SereneLife, the Radiant Saunas Rejuvenator, the Durherm, and more – at all different price points. Each one has its own controls and settings, but they all share similar attributes. *** Note: Our original review contained only the first 3 saunas, all of which were low EMF. We added two more because we were asked to review them. We have not yet tested Options #4 and #5 with an EMF meter. so if you are sensitive to EMF radiation, try these at your own risk. Our top choice for the best product in this review is the Durherm Infrared Sauna. While this unit is one of the most expensive portable saunas out there, the Durherm Infrared Sauna has many features and aspects that make it worth the investment if you are truly dedicated to finding a great sauna. Unlike many portable saunas, this infrared model is nearly EMF free, with lower readings even than natural background readings. Many other, cheaper models have low EMF readings, but the Durherm is all but EMF free, making it an incredibly healthy and detoxifying option for anyone looking for a great infrared sauna to keep at home. The best part of the Durherm is the EMF levels – or lack thereof. They claim that their EMF levels are anywhere from 200 to 600 times lower than any of their infrared competitors, and it is absolutely true. The typical, recommended EMF level is no higher than 3 mG, or milliGauss, and the Durherm tests under 3mG all the way around. The Durherm features tourmaline panels rather than carbon panels, like many other infrared saunas. Tourmaline naturally emits purifying negative ions, which is a huge part of what makes infrared saunas so relaxing. It is a semi-precious stone and has been used by masseuses and physical therapists for hundreds of years. Not many infrared saunas use this type of panel, but the Durherm does. The Durherm unit is also rather large, so it can comfortably fit a range of body sizes. It includes a foldable “sports chair” that fits easily inside, and you can readily read a book or listen to music while using the Durherm sauna. It is a bit weighty, at around 25 pounds, but its large size is great for larger individuals who wish to use an infrared sauna to help with weight loss and detoxing. The Durherm also comes with two interchangeable, soft neck collars for your comfort. The collars are washable and comfortable. 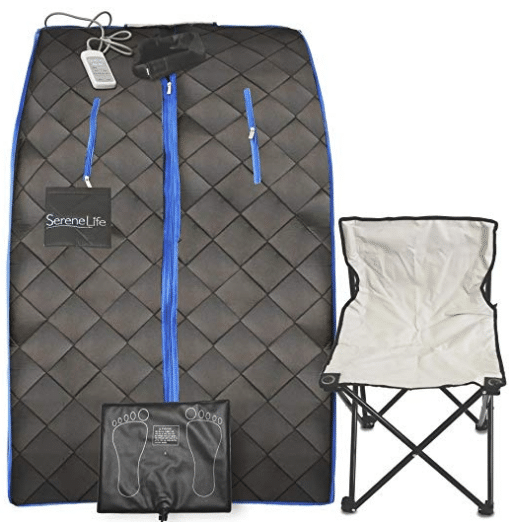 This portable sauna has a remote and a storage pocket for easily controlling the settings. The remote makes it easy to change the settings and timing of your session without much fuss, and you will not lose it with the storage pocket. For anyone looking to get a serious portable infrared sauna with all the best features on the market, the Durherm Low EMF Negative Ion Portable Indoor Sauna is a clear front runner. With amazing detoxifying materials and various heat settings, as well as a chamber that can accommodate people of all sizes, it is an all-around great portable sauna. Our second choice in this roundup of low profile bottle jacks is the SereneLife Portable Infrared Home Spa. Portable home infrared spas are becoming more and more popular, and there are a multitude of options available – ranging in size, colors, heat range, panel types, and more. One of the best, most affordable, and compact options is the SereneLife Portable Infrared Home Spa. It is, like most potable home spas, designed for one person. However, unlike some of the competitors, it is actually relatively compact, and the price tag is not terribly high, either. Though the SereneLife does not have the lowest EMF levels on the market, it is still significantly lower than many other home infrared spas. With 3 EMF panels present, it emits very low levels of EMF radiation, which makes it much safer than some other saunas. The EMF panels are also incredibly energy efficient, and can heat up faster than competing personal saunas, and they use less electricity. As with most portable saunas, it includes a foldable chair designed for easy comfort and portability. Furthermore, the unit itself is easily folded up and carried, weighing in at only 20 pounds when condensed. When in use, the SereneLife is 27.6’’ long x 31.5’’ wide x 37.8’’ deep, so it can easily fit in most rooms of your home. Some people might find the space a bit cramped, but if you are unconcerned about the personal space aspect, this compact design is a great benefit. This portable sauna can reach temperatures up to 140 degrees Fahrenheit and nearly anywhere in between. The temperature can be easily adjusted, even while you are seated inside, as it features a remote that can adjust the temperature with only a few taps. You can also adjust the self-timer with the remote for anywhere up to 60 minutes. The compact design also means that setup is easy and quick. Set up takes a minute or less, and once you plug it in, the unit heats up quickly with the energy efficient EMF panels. Furthermore, as the set-up is easy, it is safe to assume that take down is easy as well – and it is. Once you have completed your session, it is easy to clean and collapse the SereneLife for storage. This is one of the lowest priced personal saunas on the market. 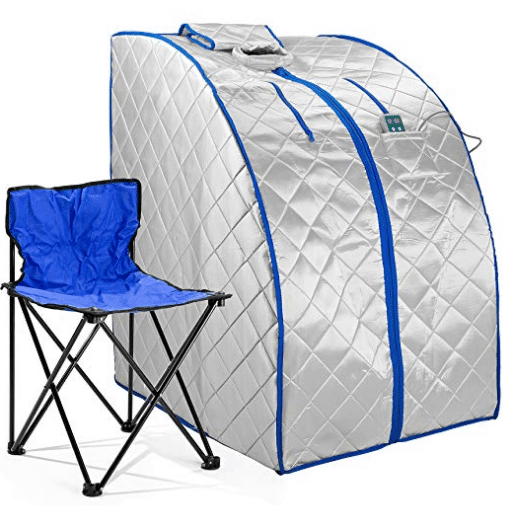 Even with the low price, this is a wonderful starter unit for anyone interested in portable saunas but who does not want to spend an exorbitant amount of money. Even with the small price tag, you get all the best aspects of an infrared sauna, and without an unhealthy amount of EMF radiation. Here are some positives and negatives about the SereneLife sauna. With a low EMF output, a compact size, and an energy efficient system, the SereneLife is a wonderful starter unit for anyone interested in the detoxifying effects of portable saunas. This s one of the most positively reviewed infrared saunas on the market, with a high percentage of people praising the SereneLife for its functionality and their results. If you are looking for a simple, compact infrared sauna to help you relax and detox, this is a great, affordable choice. #1 PERSONAL SAUNA: Can't get to the spa but want to experience the benefits of sauna therapy? No problem. This indoor sauna kit comes with everything you need to get your sauna on in the comfort of your own home! 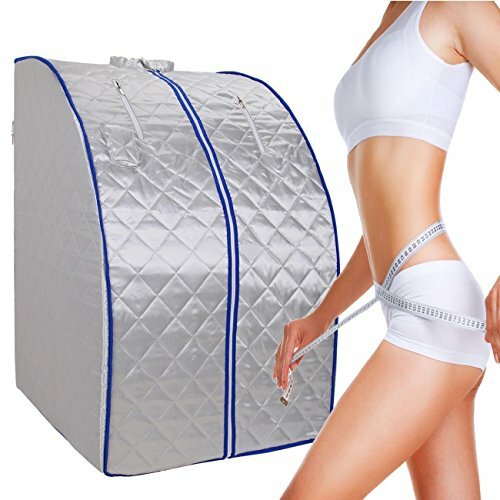 PORTABLE SAUNA UNIT: Have a mobile beauty spa or want to move your sauna dome from one room to another? Our infrared sauna is conveniently portable! You can pick it up or pack it up when need. ENJOY AND RELAX: Use this sauna to relax after a day of work, while reading books, listening to music, play on your mobile phone, watch movies and so on. 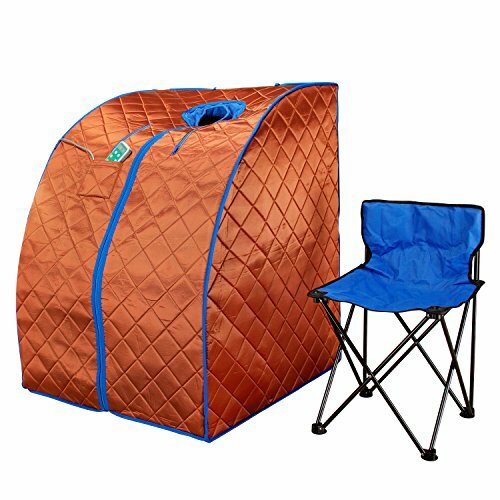 INCLUDES SAUNA CHAIR: While other saunas require you to build your own sauna room using your own stool or chair, our portable sauna comes with a comfortable (and foldable) sauna chair! SAVE MONEY ON BEAUTY SALON : the mini sauna room can service for a long time and save your money to pay to beauty salon shop. The third item in our review of the top portable infrared saunas is the Radiant Saunas BSA6315 Rejuvenator. 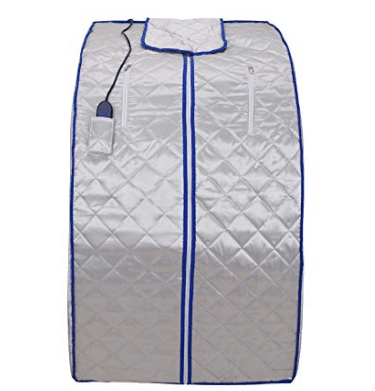 The Radiant Saunas BSA6315 Rejuvenator is one of the best portable infrared saunas available. It has hundreds of positive reviews from customers, and it is an affordable alternative for spa lovers who do not have the budget for something massive or fancy. The Rejuvenator features a lovely charcoal gray color, which is pleasing to anyone’s eyes and will fit more subtly in the home. Overall, this portable infrared sauna has some wonderful – but limited – features for anyone looking for an affordable spa alternative that will get the job done without breaking the bank. The Rejuvenator has 3 different low-level EMF carbon panel heaters, and one PVC carbon foot pad. These carbon panels emit relatively low EMF radiation, though an EMF reader will still detect some radiation. However, it is significantly lower than some other portable saunas. The Rejuvenator also has a total of 5 different heat settings, so you can easily adjust your setting to what you are most comfortable with, and also for whatever purpose you are using the sauna for. The heat settings go all the way up 150 degrees Fahrenheit and can be easily adjusted. This model also boasts an air ionizer, which frequently pushes negative ions into the air for a cleaner, fresher sauna experience. The seat inside the cabin, as well, is one of the most comfortable foldable chairs, with a wide seat to accommodate individuals of various sizes. The chair is meant to support individuals up to 180 pounds, and the cabin itself is approximately 28-in. wide x 33.5 in. deep X 38.1 in. high. Set up is quick and simple and can be done in a minute or less. Once it is set up, the sauna preheats rather quickly, and its carbon panels are also highly energy efficient. You will feel results almost instantly, and the effects of the EMF panels and negative ions begin relaxing and detoxifying your body quickly. The cabin and chair are both comfortable, although the chair could stand to be just a bit taller. Overall, the entire unit is fast, efficient, comfortable, and does its job well. With a low EMF level and wonderful energy efficiency, it is a fantastic portable sauna for anyone looking to detox on a budget. For all the features that it comes with, this portable infrared sauna runs only around $250, which is much more affordable than many of its competitors. Some portable saunas can cost upwards of $300 and all the way up to nearly $600, but for less than half the cost of some models the Rejuvenator does everything you could ever need from a portable infrared sauna. 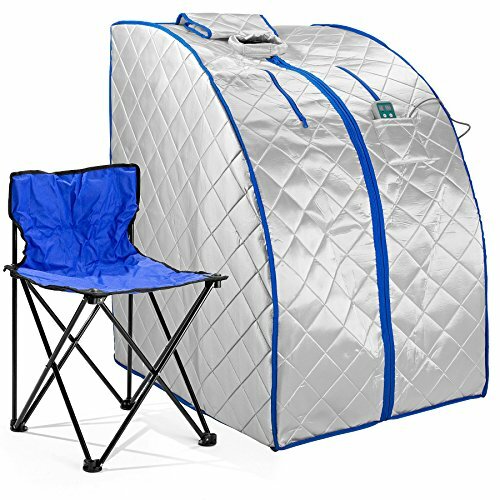 Whether you need your own sauna for help with detoxing, weight loss, pain relief, or just relaxation, the Radiant Saunas BSA6315 Rejuvenator Portable Sauna is a great option. 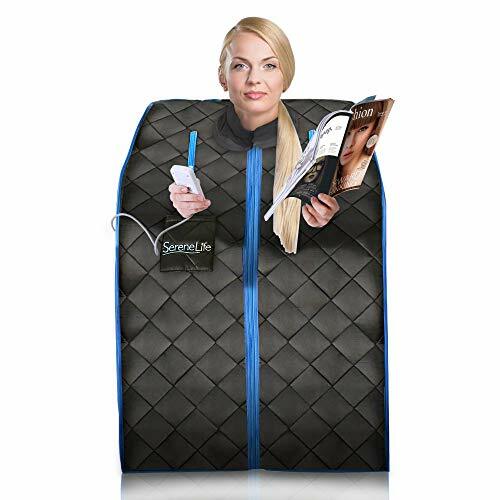 While there are some models out there with lower EMF readings, this portable sauna more than makes up for it with energy efficiency, comfort, and quick relief. The style and performance of this sauna make it one of the best options on the market, without a doubt. This is one of the most popular home saunas on the market and allows users to lose weight, feel great and nourish their skin from the comfort of their own home. It is one of the more affordable indoor spas on the market with prices hovering around the $155-$160 mark. It carries with it a wide range of health benefits. It’s great for improving circulation and alleviating aches and pains. It can also boost your metabolism and promote natural weight loss. It can improve your cardiovascular conditioning, thereby boosting your fitness levels while also leaving you with a relaxed mind and body as well as a feeling of emotional wellbeing. Despite its modest price tag, the Ridgeyard indoor spa offers an impressive wealth of features. It is lightweight and portable as well as being quick and easy to set up. Indeed, you can be up and running in about a minute. It heats up very quickly too, ensuring that your precious session time is not wasted waiting for the spa to get to its peak working temperature. This is due largely to its trio of super-conductive and ultra-thin carbon fiber heating elements. It’s comfortable and spacious for a wide range of body types, folding out to 39.3 x 26.7x 32.2 inches. It comes with its own folding chair for your comfort and a wired remote control for your convenience. You can get in shape while doing any number of your favorite activities such as watching TV, listening to music or scrolling through your social media feeds. This spa has 6 temperature settings and a 10 minute session is equivalent in terms of exhaust sweat to 30 minutes of jogging. 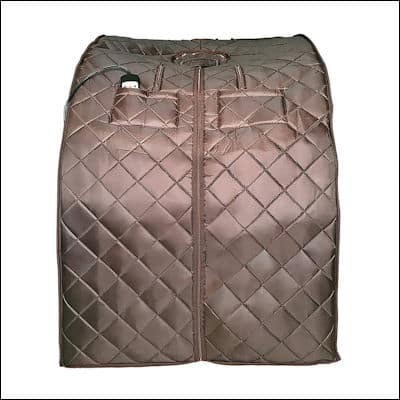 It also offers a negative ion detoxifying heat pad for your feet which literally drains the toxins out of your feet for added comfort and relaxation, draining the stress and strain away after a day on your feet. Comes with EMC certificate for your peace of mind. Easy to set up and collapse. A great all-rounder that offers superb value for money. While the unit itself is spacious, some may find the chair on the small side. 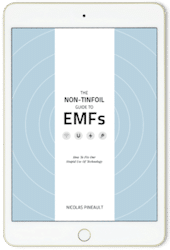 Some users with low EMF tolerances have reported that its EMF output has created issues for them. If you’re looking for an entry-level infrared sauna that gives you all the features you need for a reasonable price, it’s hard to argue against the Ridgeyard indoor spa, unless you have especially high EMF sensitivity. ENJOY YOURSELF: there is a foldable chair comes together and the humanized design personal sauna keep your head and hands out and let you free to do other things while you enjoying sweat steaming, you could read books, listening to the music, play your mobile phone, watch movies and so on, get healthy body while entertainingonal health care: lose weight, remove toxin, reduce stress and fatigue. Similar to the Ridgeyard unit in most respects, Durasage’s far Infrared portable spa also comes with a heated foot pad and chair. It has many similar features and specifications although it comes with a slightly higher price tag, typically hovering around the $200 mark. It has the slight edge on Ridgeyard’s effort in terms of comfort although it is ever-so-slightly smaller with a width of 27.5″ x 30″ in depth and 38″ in height. It is an easy to use and eminently affordable solution for those experiencing muscle pain and fibromyalgia while also helping to ease natural weight loss through sweating out water and toxins which lead to water retention and bloating. The Durasage unit is clearly focused on providing consumers with the same features offered by larger and more expensive units but with a more budget-friendly price tag. Like the Ridgeyard equivalent, it is quick to hear up, reaching its peak temperature of 150 degrees in just 5 minutes. Its robust performance comes from its use of 3x ultra thin and superconductive carbon fiber heating elements. It offers robust performance for long periods of time, too. You can enjoy a session of up to 60 minutes with this bad boy! It is designed to fit snugly and allow you a full range of motion with which to watch TV, read or play with your phone while you sweat away the excess pounds and toxins. It also has a heated foot pad to drain the stress away from tired and overworked feet. While the Durasage infrared spa offers a good range of features for a reasonable price, it is not without a few caveats. An instruction manual is not provided with this product, although you can download a .pdf file here. Users also report high EMF output making it potentially unsuitable for users with high EMF sensitivities. This is a well priced unit that offers everything you could want at a home infrared spa, with an affordable price tag. Given the slightly lower price of the Ridgeyard unit and the similarities between the two however, the Ridgeyard unit offers slightly better value for money. Both units, however, offer a satisfying home spa treatment and all of the health benefits that come with it. We all benefit from a visit from our local spa. Not only is it an intensely relaxing experience that can leave us feeling refreshed, restored and reinvigorated, it can also aid weight loss and rid our bodies of harmful toxins and excess water. However, there’s no denying that a visit to your local spa can be expensive, especially if you visit on a regular basis. What’s more, when you factor in the time spent travelling to and from your favorite spa, it can seriously eat into your day and your week. If only there was some way you could get all the benefits of a spa visit from the comfort of your own home, right? Well, there’s good news. In today’s technologically advanced world, the health conscious spa aficionado can enjoy all the goodness of an expensive spa visit at a fraction of the price. Portable infrared saunas have been on the market for some time now and have proven enormously popular for a variety of reasons. They allow you to combine the health boons of spa membership with the convenience of doing all your favorite activities in your living room while you sweat the stress and toxins away. Here we’ll take a look at what exactly infrared light is, how it works, some of its inherent health benefits and how infrared spas measure up against their steam-based counterparts. Here are the basics about infrared portable saunas, some typical features, and what you should look for. A sauna in itself is a room of enclosed space of which the purpose is to raise the body’s temperature, which can provide a number of health benefits. Saunas have become an increasingly popular “natural” aid for people hoping to relieve stress, lose weight, or fight pain. A portable infrared sauna, then, serves the same purpose as a typical sauna, but in a compact form. Portable infrared saunas, as the name implies, as portable, so they are typically compact – usually large enough for only one person – and are easily collapsible and set up so that you can take them with you to various places. The other main component of the portable infrared sauna is the infrared. Whereas most saunas use steam to heat the body, these portable units use infrared light – usually “far” infrared – to increase the body temperature. This method is quicker and more efficient than the average spa sauna. Infrared light is form of radiation that is invisible to the naked eye but even though we cannot see it, we can certainly feel it. Every time we feel the heat of the sun or the warmth of a candle that’s infrared light you’re feeling. Infrared light is comprised of the same kind of electromagnetic waves as ultraviolet rays, x-rays, microwaves and radio waves. Home infrared spas allow us to use the heat from infrared rays to elevate the ambient temperature in the small, tent-like structure of the home spa. This causes us to sweat in the same way that a steam room or sauna at your local spa does. Except, of course, that you get the added luxury of being able to watch your favorite TV shows or movies, enjoy your favorite music, read and do virtually anything else that you love to do in the comfort and privacy of your living room. So, now that we know a little about infrared light and how it works in this context, let’s take a look at why so many people have chosen to embrace the infrared home sauna. So, why have so many people around the world brought these convenient portable devices into their homes? Spending time in an infrared sauna has a range of benefits for both the body and the mind. They use far infrared light waves, similar to those that radiate naturally from the sun but without the damaging effects for your skin that is carried by ultraviolet waves (which are at the opposite end of the light spectrum to infrared. This is why you will never tan when using a home infrared sauna and you can sweat away merely without worrying about your risk of melanoma. These waves of electromagnetic radiation have a range of mood boosting benefits, giving us a feeling of happiness and euphoria. They can even help you to lose weight and inches as you burn calories and sweat out excess water that you may be retaining. In terms of exhaustion sweat, just 10 minutes in an infrared spa is equivalent to spending a half hour on a treadmill. Stress relief– We all emerge from a spa session feeling drained of stress, anxiety and low mood. Using an infrared spa is relaxing and soothing and is a healthy way to relieve stress from the comfort of your living room. Ease joint and muscle pain– Those who frequently experience joint and muscle pain and stiffness including conditions like fibromyalgia will find that using an infrared sauna regularly goes a long way to mitigating their joint, muscular and skeletal pain. Gives your skin its youthful luster back– Over time, the dead skin cells that accumulate on the surface of our skin can make us look pale, ashen and unhealthy and aging you before your time. Infrared light can facilitate better blood flow to the skin, allowing it to get the oxygen and nutrients it needs to restore your healthy and youthful glow. As you sweat, you rid your skin of dead skin cells and help to generate new ones. Clears your system of toxins– We all pick up toxins from our diet and environment throughout the day. While our kidneys and liver are pretty proficient at filtering them out, the skin is also instrumental in ridding your body of toxins. As you sweat, all of the toxins and heavy metals in your system are leaked out of your body through your pores. Boosts your immune system– An infrared sauna can even reduce your chances of getting sick in future. Time spent in an infrared sauna stimulates your body’s production of white blood cells which are instrumental in sending colds, bugs and viruses packing. Those who are accustomed to a traditional steam sauna may ponder the relative merits of an infrared sauna over its steam based alternative. First of all, they’re significantly cheaper. A portable infrared sauna is around a tenth of the price of your very own steam sauna. They’re much cheaper to run, too as the carbon fibre panels in portable infrared saunas require very little power to operate. Unlike a steam sauna, a portable infrared sauna can be taken anywhere in the home. They take just a minute or two to set up or to fold away. What’s more, you can use an infrared sauna with the whole family in the same room without driving up the ambient humidity. Now that you understand what a portable infrared sauna is and the benefits it can provide, here are just a few components to consider when you are searching for the one that is right for you. A major part of nearly any infrared sauna is the EMF radiation factor. There are levels of EMF radiation that are considered safe – usually around or under 3 mG (milliGauss). Some portable sauna units go over this EMF level, and some really push the limit. Consider this factor when looking for your unit. 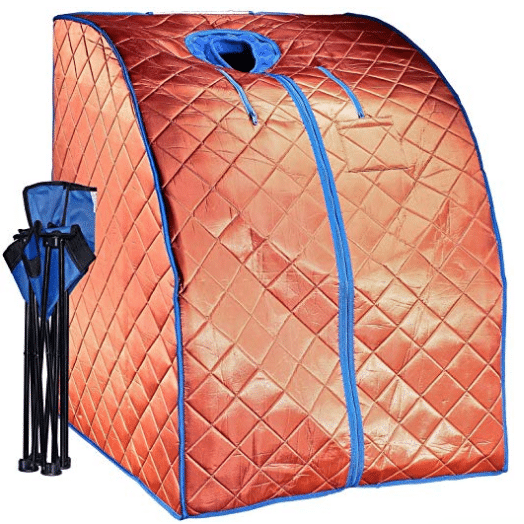 As with any purchase, a portable sauna is an investment. Consider price point when searching for the one that is right for you. These saunas can run anywhere from $150 to over $500. The more expensive ones will have more features, so choose wisely. Most portable saunas are only big enough for one person, and they will include a folding chair. When looking for your own sauna, be sure to find out exactly how large it is, and how much weight the chair can hold. If you are buying a sauna in hopes of losing weight, make sure you get a unit that can accommodate you throughout the entire process. Some units are quite large, where others are much more confined. Get one that is comfortable for you. There are a wide range of reasons why virtually everyone should consider investing in an infrared sauna. They’re cheap to buy and operate, have a huge gamut of health benefits and are superior in pretty much every way to a steam sauna. The health benefits of a portable infrared sauna are staggering, and well worth your investment. Do some research, find the unit that works for you, and begin your personal spa journey – without breaking the bank.